View from the garden of the new enclosed porch or conservatory. The rockery and planting areas near the foundation were installed as a transition to the main landscaped areas. 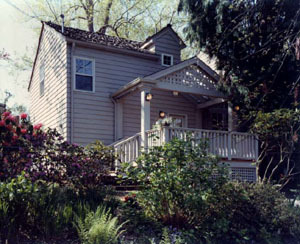 Replace a 10-year-old back porch and partial glass roof (originally designed by CASA; see photo below) with a larger, enclosed space to serve as an extension of the existing family room and kitchen and a transition to the back garden. 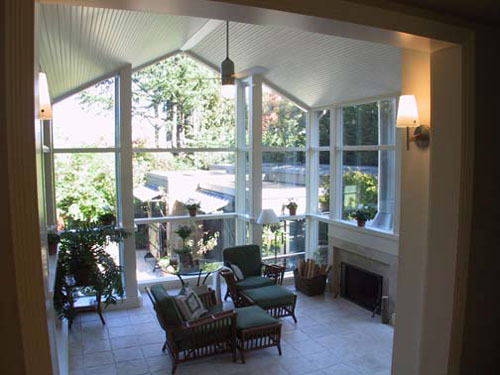 Create a luminous space evoking the simplicity of a screened porch or verandah, but enclosed in glass to be suitable for use year-round in the Seattle climate. 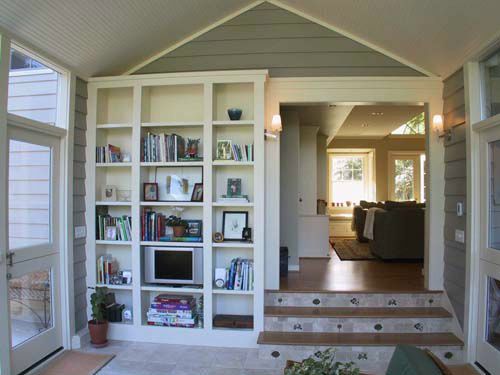 Modify the existing family room and back entrance as needed to harmonize with the new enclosed porch. 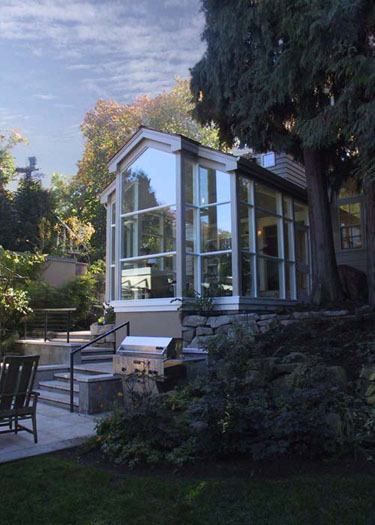 The starting point: a 10-year-old back porch that was replaced with the larger, glass-enclosed structure. The back door opens to the family room, which in turn opens to the kitchen toward the right. Increased the footprint of the porch area. Designed a cathedral ceiling, to keep the space as airy and luminous as possible and emphasize its connection with the outdoors. Specified custom glazing units stopped directly into the structural posts. By eliminating window frames, this lightened the overall effect, much like the use of screening in a verandah. This simplicity required impeccable craftsmanship and high quality materials to ensure precise fit. 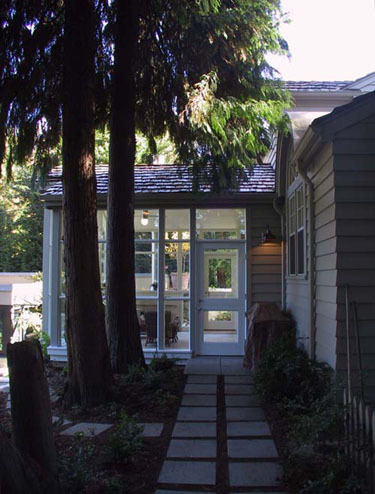 Widened the existing back door into a five-foot open passageway, creating a more direct connection with the existing family room and enhancing the porch’s function as a transition space. Applied siding elements inside the covered porch, to maintain its connection with the exterior of the house. Harmonized the interior of the covered porch with the existing family room — and achieved a seamless transition — through the comprehensive selection and placement of interior finishes and colors, fixtures, rugs, furniture, cushions, and other accessories. Installed a heated floor to avoid unsightly ductwork yet maintain a dry, comfortable space during Seattle’s damp winters. Added a rockery, planting areas, and a new pathway to integrate the covered porch with the garden and enhance circulation. View east toward one of two exterior doorways. The second is in line on the other side. Interior view toward the garden, showing the gas fireplace with limestone surround and the matching heated floor. CASA worked closely with the owner to select the fixtures (such as the ceiling fan and lamp), furniture, and accessories. 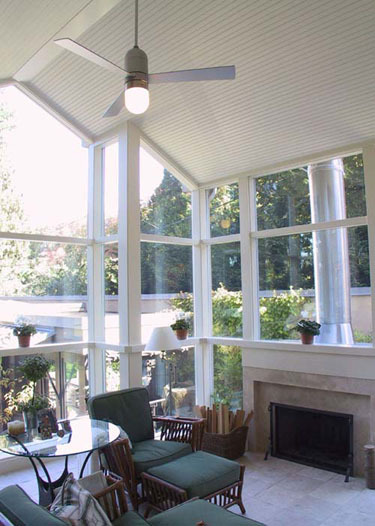 View from inside the conservatory toward the existing family room, showing how siding surfaces (gable and side walls) were used to create a transition to the outside. The doorway is in the position of the original back door but was widened to five feet. Decorative stone tiles with floral motifs were used as accents in the stair risers, and the built-in cabinetry was custom designed to accommodate the LCD television. To harmonize the family room and kitchen with the new space, their floor was refinished and walls repainted. View through the conservatory toward the garden from the stairs leading to the existing family room. CASA worked closely with the owner to select and place all lighting fixtures, such as the two sconces in the doorway.